"The first four stories are the last ones I have written. The others follow in the order in which they were originally published. The first one I wrote was “Up in Michigan,” written in Paris in 1921. The last was “Old Man at the Bridge,” cabled from Barcelona in April of 1938. Beside The Fifth Column, I wrote “The Killers,” “Today Is Friday,” “Ten Indians,” part of The Sun Also Rises and the first third of To Have and Have Not in Madrid. It was always a good place for working. So was Paris, and so were Key West, Florida, in the cool months; the ranch, near Cooke City, Montana; Kansas City; Chicago; Toronto, and Havana, Cuba. Some other places were not so good but maybe we were not so good when we were in them. There are many kinds of stories in this book. I hope that you will find some that you like. Reading them over, the ones I liked the best, outside of those that have achieved some notoriety so that school teachers include them in story collections that their pupils have to buy in story courses, and you are always faintly embarrassed to read them and wonder whether you really wrote them or did you maybe hear them somewhere, are “The Short Happy Life of Francis Macomber,” “In Another Country,” “Hills Like White Elephants,” “A Way You’ll Never Be,” “The Snows of Kilimanjaro,” “A Clean, Well-Lighted Place,” and a story called “The Light of the World” which nobody else ever liked. There are some others too. Because if you did not like them you would not publish them. In going where you have to go, and doing what you have to do, and seeing what you have to see, you dull and blunt the instrument you write with. But I would rather have it bent and dull and know I had to put it on the grindstone again and hammer it into shape and put a whetstone to it, and know that I had something to write about, than to have it bright and shining and nothing to say, or smooth and well-oiled in the closet, but unused. Now it is necessary to get to the grindstone again. I would like to live long enough to write three more novels and twenty-five more stories. I know some pretty good ones. 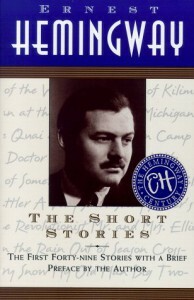 The first Hemingway for me! And yes, a weird choice to start..